Mr. Gorilla Offroad himself is showing everyone how dirty his own car gets this week! Tell us a little about yourself: I own Gorilla Offroad Company, but also have a full-time job as a Database Administrator at Duke University. My wife, kids, and dogs get a lot of my attention but when I am able to pull away for some “me” time, I like to hit the trails in my Outback or my Mountain Bike. I spend time on the basketball and volleyball courts, and actually enjoy a little golf when the opportunity presents itself. I also enjoy creating things with 2x4s as a hobby too. I like simple, sturdy designs so I tend to find (or try to find) home improvement projects that use 2x4s and a miter saw! How did you get into cars? When I was 9 years old, I went on a trip to Scotland and saw (and got to ride in) a 1968 Mini Cooper – that did it for me – it was like a street legal go-cart. What is your dream car? 1964 Mini Cooper S in the Monte Carlo Rally livery! What are your future plans for the car, and what do you like to do with it? The Outback will be handed down to my oldest son in two years – until then, high mileage maintenance and one thorough inspection before handing it off is all it needs. What's your favorite thing about your car? Aside from the obvious safety that is inherent with owning a Subaru, I’d have to say my favorite thing about the car is how well it represents Gorilla Offroad Company – everything is simple, functional, and reversible. What is something that you don't like about your car? The motor – I wish I had the H6. What is your car like to drive? The wagon is pretty stable and able to negotiate a decent dirt road/trail without much thought or concern. What was your inspiration or objective with this build? 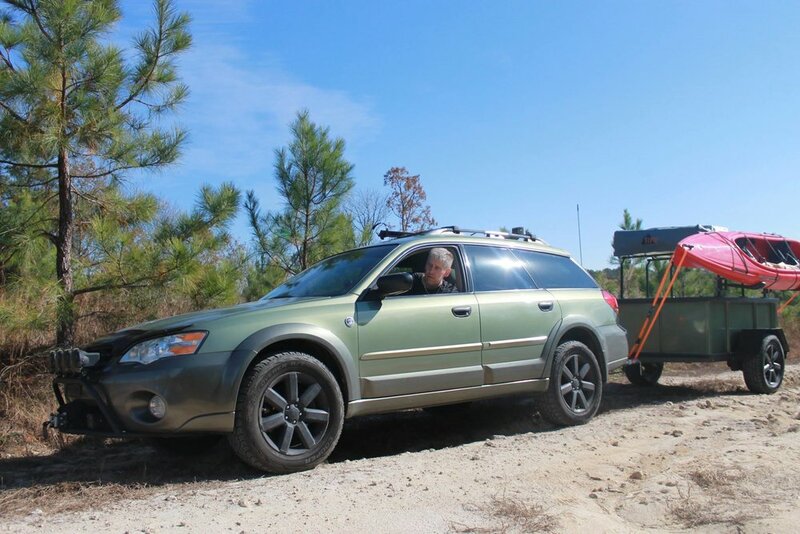 The inspiration came from what I did to the previous Subaru I owned – the 2002 Subaru Impreza Outback Sport from which Gorilla Offroad Company was born. So, the objective was simple, make the Outback as trail worthy, if not more, than any other vehicle while maintaining a daily-drivable ride. Why did you choose a Subaru? Safety, reliability, and all-wheel drive! What was your first car? The first car I bought on my own was a 1977 Plymouth Arrow. What is something about you (or your car) that no one else would know about? What most people with any relation to Subaru or Gorilla Offroad Company would not know about me is that I was a nationally ranked mascot for Old Dominion University when I attended in the 1990’s.